HONG KONG, April 19, 2018 /PRNewswire/ — The Impossible Foods is launching its award-winning plant-based meat in Hong Kong at some of the city’s most beloved restaurants: Little Bao, Happy Paradise, and Beef & Liberty. Started in 2011 by Stanford biochemistry professor and former pediatrician Dr. Patrick O. Brown, Impossible Foods makes meat, fish and dairy directly from plants a�� with a much smaller environmental footprint than those from animals. The company uses modern science and technology to create wholesome food, restore natural ecosystems and sustainably feed a growing global population. Ranked one of the world’s top culinary hotspots by Conde Nast Traveler, Hong Kong is the first place outside of the United States to feature the Impossible Burger, which cooks, smells and tastes like ground beef from cows but is made entirely from plants. The Impossible Burger is served in more than 1,400 outlets in the United States — from award-winning restaurants to mom-and-pop diners to the nation’s original fast-food chain, White Castle. The vast majority of these restaurants serve the Impossible Burger on a bun with traditional condiments and sides. Starting tomorrow in Hong Kong, diners will be able to try the product as a traditional burger — and as the central filling of savory street food. "We’re humbled to launch with spectacular chefs in one of the world’s most dynamic restaurant hotspots," said Brown, CEO and Founder of Impossible Foods. "We’re confident that Hong Kong — Asia’s crossroads of ideas and influences, both modern and traditional — will be home to the most innovative Impossible recipes yet." 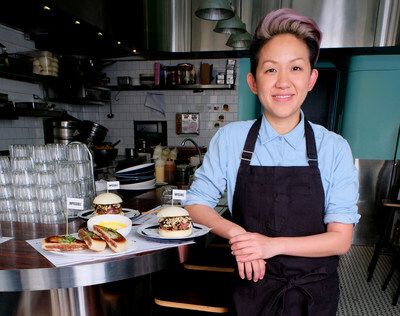 Chef May Chow, named Asia’s Best Female Chef in 2017 by The World’s 50 Best Restaurant awards, heads Little Bao and Happy Paradise — 21st century takes on traditional Cantonese diners. Chow is a Toronto native who trained and worked in Bangkok, Los Angeles and Boston. She gained fame in Hong Kong’s renowned street food markets and helped to transform Hong Kong into a foodie destination. Chow has also represented Hong Kong at food festivals such as "Omnivore" in Paris and Shanghai. Starting tomorrow at Little Bao, Chow and her team will serve the "Impossible Bao," a traditional sandwich made with Impossible meat, black pepper teriyaki sauce, salted lemon kombu salad, and fermented tofu sauce, between two house-made steamed buns — on menu for 118 HK$. The "Impossible XinJiang Hot Pocket" — another popular Chinese street snack — will debut at Happy Paradise, served with pickled daikon and XinJiang spices, for 88 HK$. "Hong Kongers demand to be on the bleeding edge of global culinary trends," Chow said. "The Impossible Burger is delicious, versatile and perfectly timed to take this city’s world-class restaurant scene by storm." Another award-winning chef in Hong Kong, Uwe Opocensky earned his culinary reputation working in restaurants such as Spain’s El Bulli, voted the best restaurant in the world. He recently spent a decade as Executive Chef at Hong Kong’s Mandarin Oriental — considered one of the city’s finest establishments — overseeing 10 restaurants and bars and collecting Michelin Stars in three of the venues. 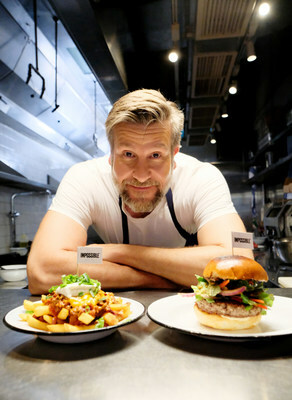 He left the hotel in 2016 to join Beef & Liberty as Group Executive Chef, now lauded as Hong Kong and Shanghai’s best hamburger, and is also chef at his own restaurant Uwe. The seven restaurant group is a modern homage to 18th century "beefsteak clubs," reincarnated for modern tastes with a focus on natural ingredients and sustainable operations. Popular with both natives and expats, Beef & Liberty uses only hormone- and antibiotic-free beef from the Scottish Highlands — ground in-house — and also purifies and carbonates its own drinking water to reduce the amount of water imported (and glass bottles wasted) into Hong Kong. Beef & Liberty will serve the "Impossible Thai Burger," with chilli, coriander, mint, basil, spring onion, soya mayonnaise, crispy shallots and garlic, for 135 HK$. The restaurant group will also feature "Impossible Chili Cheese Fries," with chili, cheddar cheese, spring onion and sour cream over their "Liberty" fries, for 62 HK$. "We are obsessed, in a good way, with burgers and doing what we can for the environment. We love the way that the Impossible Burger has created new excitement in the global burger scene and opportunities to be more sustainable," said Beef & Liberty’s Executive Chef, Uwe Opocensky. "We’re positive that our guests are going to love the Impossible and feel good about eating it at the same time." Starting today, the Impossible will be available in Hong Kong on a limited and exclusive basis through Classic Fine Foods — Asia’s leading importer and distributor of fine foods. The group specialises in sourcing, importation, storage, marketing and distribution, and has been operating throughout Asia and Europe since 2001. In development since 2011, the Impossible Burger debuted in July 2016 at Chef David Chang’s Momofuku Nishi in Manhattan. The Impossible Burger is the only plant-based burger to win a 2017 Tasty Award and a 2018 Fabi Award from the National Restaurant Association. In addition to the American fast-food chain White Castle, The Impossible Burger is the only plant-based burger featured in America’s most beloved "better burger" concepts Fatburger, Umami Burger, Hopdoddy, The Counter, Gott’s and B Spot, the Midwest burger restaurant owned by Chef Michael Symon. The Impossible Burger is made from simple ingredients, including water, wheat protein, potato protein and coconut oil. One special ingredient a�� heme a�� contributes to the characteristic taste of meat and is the essential catalyst for all the other flavors when meat is cooked. Heme is an essential molecular building block of life, one of nature’s most ubiquitous molecules. Although it’s found in all living things and in virtually all the food we eat, it’s especially abundant in animal tissues. Impossible scientists discovered that it’s the abundance of heme in animal tissues that makes meat taste like meat. To satisfy the global demand for meat at a fraction of the environmental impact, Impossible Foods developed a far more sustainable, scalable and affordable way to make heme and therefore meat, without the catastrophic environmental impact of livestock. The company genetically engineers and ferments yeast to produce a heme protein naturally found in plants, called soy leghemoglobin. The heme in the Impossible Burger is identical to the essential heme humans have been consuming for hundreds of thousands of years in meat a�� and while it delivers all the craveable depth of beef, it uses far fewer resources. The Impossible Burger is produced without slaughterhouses, hormones, antibiotics, cholesterol or artificial flavors. It uses about 75% less water, generates about 87% fewer greenhouse gases, and requires around 95% less land than conventional ground beef from cows. Based in Redwood City, California, Impossible Foods makes delicious, nutritious meat and dairy products directly from plants a�� with a much smaller environmental footprint than meat from animals. The privately held company was founded in 2011 by Patrick O. Brown, M.D., Ph.D., formerly a biochemistry professor and Howard Hughes Medical Institute investigator at Stanford University. Investors include Khosla Ventures, Bill Gates, Google Ventures, Horizons Ventures, UBS, Viking Global Investors, Temasek, Sailing Capital and Open Philanthropy Project.